Matt ffytche is Director of the Centre for Psychoanalytic Studies, University of Essex and also Editor of the journal Psychoanalysis and History. Originally with a research background in literature and intellectual history (Queen Mary) my book The Foundation of the Unconscious: Schelling, Freud and the Birth of the Modern Psyche (Cambridge, 2011, pbk 2013) is an exploration of the early-nineteenth century development of the concept of the unconscious in Romantic and German idealist philosophy and psychology. Since moving to Essex, I’ve concentrated more on the history of psychoanalysis in the mid-twentieth century, and particular its relation to sociology. I have co-edited a book with Daniel Pick (Birkbeck) on Psychoanalysis in the Age of Totalitarianism which is due out in Spring 2016, including essays by Stephen Frosh, Jacqueline Rose, Derek Hook, Eli Zaretsky, Ruth Leys and Lyndsey Stonebridge. I have just completed a year-long mid-career fellowship funded by the Independent Social Research Fund (2014-15) investigating ways in which the concept of ‘projective identification’ can be recontextualised within social theory in order to develop its use within social research. I also have a long-term interest in avant garde poetry and poetics from modernism to contemporary experimental work, and have published and delivered various talks on the relation between psychoanalysis and poetry (on 21 November I will be running a workshop on ‘D.W. Winnicott and Poetic Practice’ with the poet and literary scholar Andrea Brady at the Brunei Gallery, SOAS, as part of a conference celebrating the publication of Winnicott’s collected works). I teach on the Centre’s MA programmes on Psychoanalytic Studies and on Jungian and Post-Jungian Studies (modules include ‘Psychoanalytic Theory’, ‘Freud in Contexts’ and ‘Thinking Psychoanalytically’) and also on the new BA Psychoanalytic Studies which will run from October 2016. I have several PhD students working on psychoanalysis in relation to literature, philosophy and critical theory. 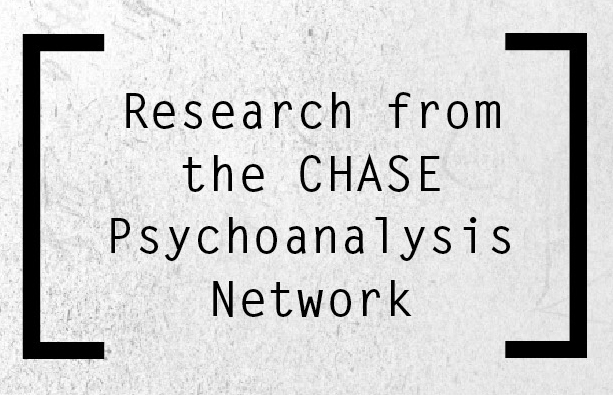 On the Research front, the Centre for Psychoanalytic Studies has a particular cluster on psychoanalysis and history, including myself, Karl Figlio, Bob Hinshelwood, Michael Roper, Leonardo Nascimento and Kevin Lu. Co-edited with Daniel Pick, Psychoanalysis in the Age of Totalitarianism (Forthcoming 2015, Routledge). Collection of Essays. The Foundation of the Unconscious: Schelling, Freud and the Birth of the Modern Psyche (Cambridge University Press, 2011, pbk 2013) pp1-305. ‘Freud and the Neocons: The Narrative of a Political Encounter from 1949-2000’, Psychoanalysis and History, 15, 1, January 2013, pp5-44. ‘Night of the Unexpected: A Critique of the “Uncanny” and its apotheosis within cultural and social theory’, New Formations: A Journal of Culture/Theory/Politics, 75, Summer 2012, pp63-81. ‘Objects and How to Survive Them: Several Views of John Wilkinson’s ‘Saccades’’, Journal of British and Irish Innovative Poetry, Issue 2, 1 (March 2010) pp7-34. ‘The Most Obscure Problem of All’: Autonomy and its Vicissitudes in The Interpretation of Dreams’, Psychoanalysis and History, vol 9:1, 2007, pp39-70, (14,000 words). ‘The Superego as Social Critique: Frankfurt School Psychoanalysis and the Fall of the Bourgeois Order’, in Matt ffytche and Daniel Pick (eds), Psychoanalysis in the Age of Totalitarianism, (Forthcoming 2016, Routledge/New Library of Psychoanalysis). ‘Sigmund Freud: Psychoanalysis and the Unconscious’, in Anthony Elliott and Jeff Prager (eds), Routledge Handbook of Psychoanalysis in the Social Sciences and Humanities (forthcoming 2016, Routledge). ‘Investigating Bion’s Aesthetic Turn: A Memoir of the Future and the 1970s’, in Bob Hinshelwood and Nuno Torres (eds) Bion’s Sources: The Shaping of Genius (Routledge, 2013), pp. 168-178. ‘‘The Modernist Road to the Unconscious’, in Peter Brooker, Andrzej Gasiorek, Deborah Longworth, Andrew Thacker (eds), The Oxford Handbook of Modernisms (Oxford UP, 2010), pp410-428. ‘Poetry Psychoanalysis and Negation’, Psychoanalysis and Literature Seminar, Institute of Psychoanalysis (21 March, 2015). ‘The Unconscious and the Private Life’, Histories and Theories of the Unconscious conference, Queen Mary (22 November 2014). ‘Psychoanalysis and the Arts Beyond Biography’, University of Edinburgh (28 February 2014). · ‘Mythos in Evolutionary Time: Schelling, Freud and H. P. Lovecraft’s ‘Cthulhu’’, Centre for the Study of Myth, University of Aberdeen (1 May 2013). ‘The Embryo Individual: Early twentieth‑century psychodynamic perspectives on the origins of selfhood’, Centre for the History of Psychological Disciplines Seminar Series, UCL (11 December 2012). Talk on The Foundation of the Unconscious: Schelling, Freud and the Birth of the Modern Psyche, Forum for Nineteenth-Century Studies, Birkbeck (19 March 2012).